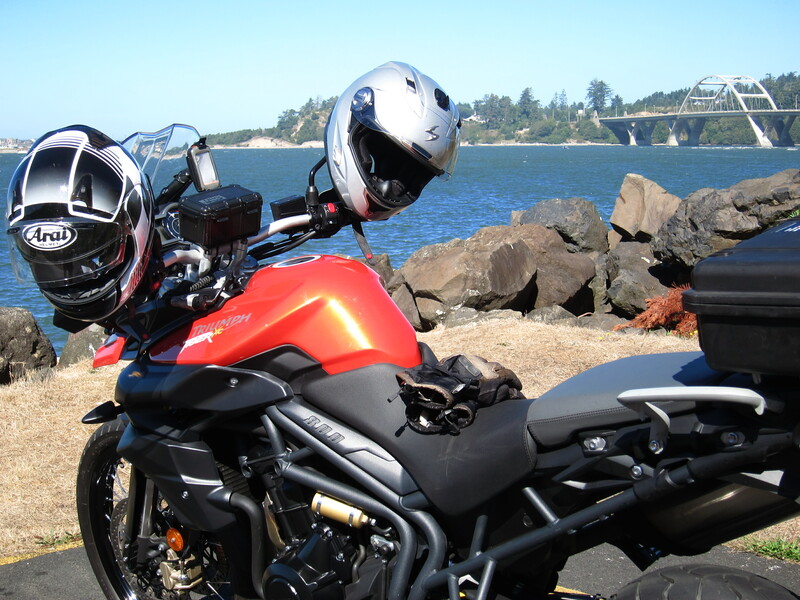 ← The Ducati goes to Yachats on the Oregon Coast. Again! You must be thinking how these stories have become boring and repetitive. And you are right. 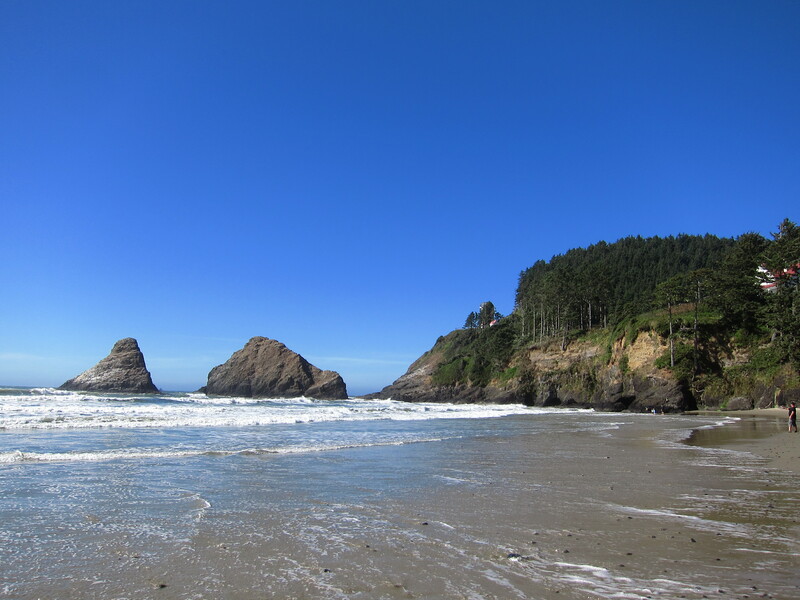 Sunday after Sunday there I go to the coast or some other place, showing off Oregon’s beautiful landscapes and most of the times spoiling the view with a motorcycle. Next year, I’m thinking about more action report. For now be happy with the same old, same old. 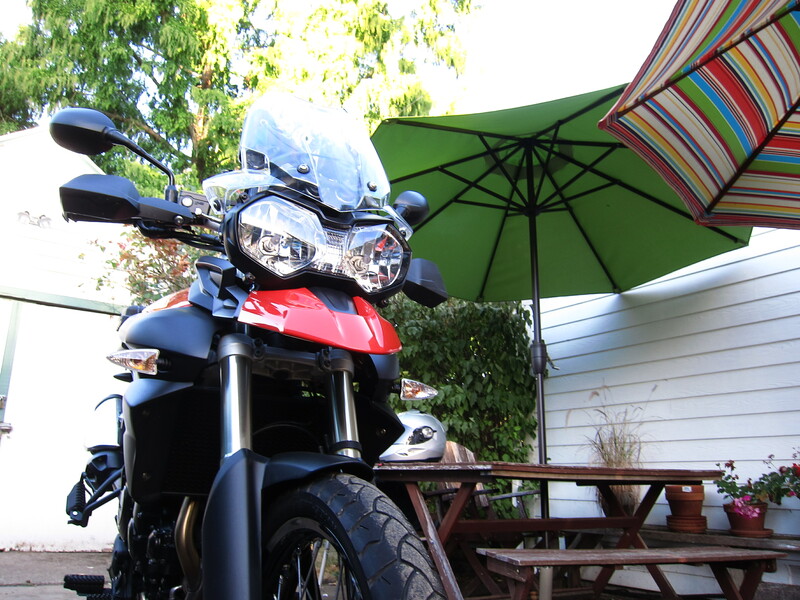 I rolled the Triumph out of the garage today instead of the Yellow Ducati. By the way, that Ducati is soon to become a collector’s item. But you did not hear anything from me on this matter… yet. Today I was going to ride with Lisa, another local rider. 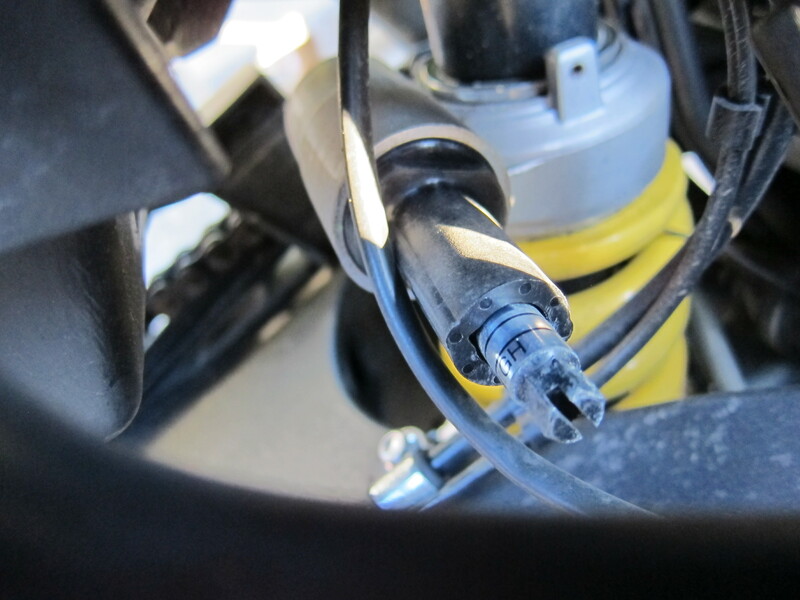 When she arrived and upon checking her motorcycle’s tires we realized maybe it was not such a good idea to take her bike on a 200 mile journey. The tires look good still, but not quite. So why not try the Tiger 2-up? I’ve traveled with a passenger on my XL 250 many times. Those were good times, when I barely had money for gas, the bike was small, but everything seemed then as nice as today. And I also traveled with a passenger on my Dakar with the 650 cc single cylinder motor which has exactly half the horse power of the Tiger. The Tiger is very likely to handle it well. And on this Triumph you have the luxury and safety of adjusting rear suspension pre-load and damping. Still, we decided to go for a trial run first, we rode the 13 miles to Junction City to see how things worked. I checked with Lisa and she said all was good. The first couple of miles I was extra careful and by the time we got to the gas station in Junction City things were looking good. Except whenever we stopped. This bike is tall and I don’t flat foot it. At one point I almost had to make another entry on my book of stupendous embarrassments. And I have quite a long list of those, mind you, but that is another story. What happened is that at some point we were stopped, getting ready to merge on Hwy 101 after one of our stops, and all of a sudden the bike was tipping to the right and it went very, but very close to the point of no return. I channeled all my soccer playing strength to keep my right leg firm on the ground and with the upper body and arms, and a grunt like that of a heavy weight lifter on his final attempt for a gold medal, I pulled the handle bars back up. What a relief. After that I was over careful when stopping this beast. When in motion, however, this bike was surprisingly good with a passenger, which probably was helped by Lisa being a rider herself, and a great passenger. But I’m getting ahead of myself here. Leaving Junction City we took 99W and turned west towards Alpine Rd just north of Monroe and from there to the Alsea Falls where me made a stop. 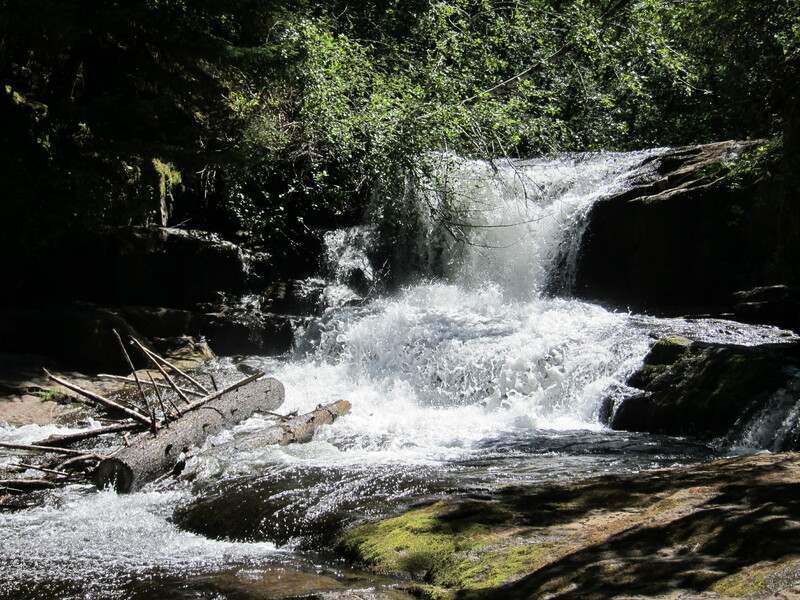 Remember when I was in the Alsea Falls in June? And below, this was now at the end of September. Major change in water volume, of course. Still beautiful and it was nice to be there. 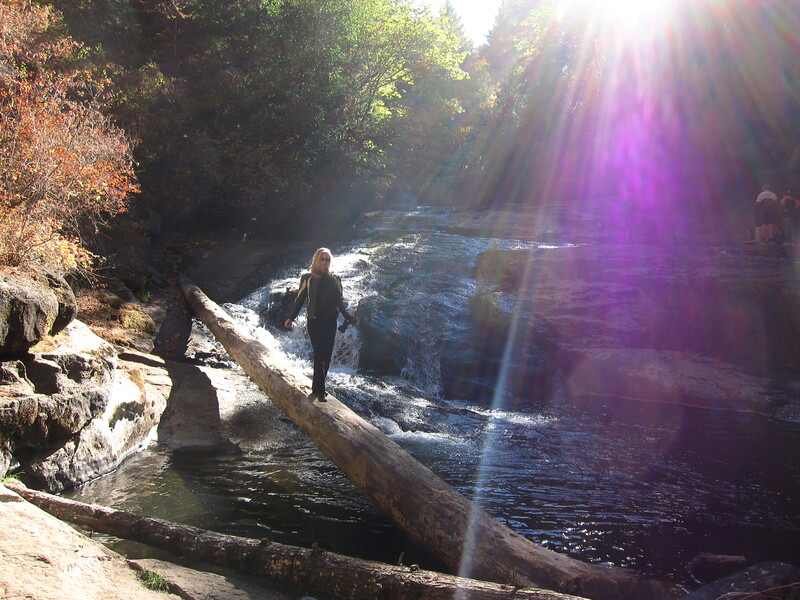 We went for a short hike along the river, climbing rocks and balancing on logs over the water and that kind of fun stuff. A family was doing the same thing and they had a small poodle with them. All of the family, the parents and the kids, went over a log to cross a part of the river and the poor dog didn’t have the courage to do it and stayed behind. The incredibly smart little dog came to me and begged me for a lift by climbing on my leg. I had no choice against such a compelling request, I picked him up and balancing over the log the best I could I took him across the water, reuniting him with his family. Does doing that for a dog count as a good deed? One more picture of the falls. From here we got on 34 towards Waldport. 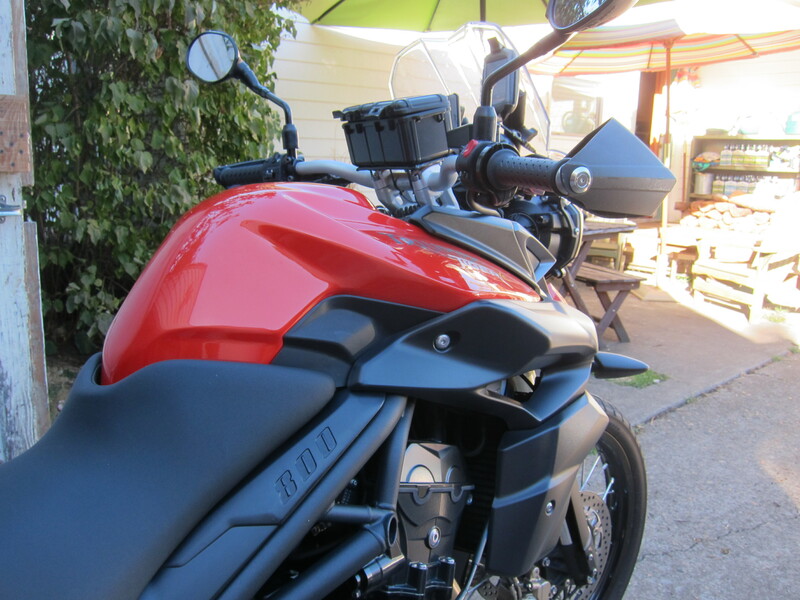 By now I was feeling the bike a lot more balanced and it was riding quite nicely. I started to delay the turn entry-points to speed up the turn in and the bike did just fine. Well, a lot of it has to do with the passenger, of course. It makes a difference having someone who knows what they are doing while seating there on the back. The bike should get some credit as well. We continued on and made a quick stop in Waldport. Check the bridge over the Alsea river on the background. When leaving this area is where I almost dropped the bike with both of us on board… 2-up, almost 2-down. Continuing south we had lunch at the same restaurant I’ve been to many times already. I need someone to help me kick this habit. Or maybe not. That same restaurant. In that same town. And another stop, this time to get a sea level view of the Heceta Light. 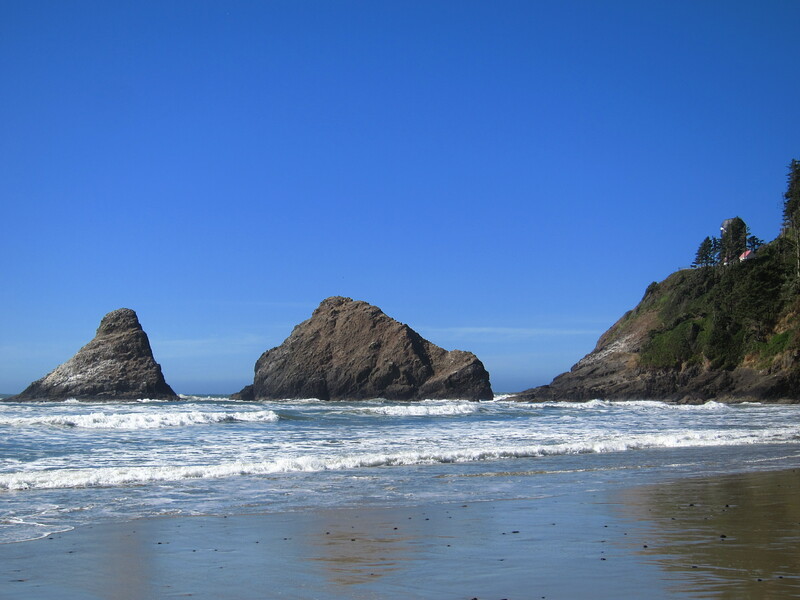 Heceta Light as viewed from the sea level. It is behind the trees from this view and still under renovation. We checked a cave close to the water line. You can see another Hwy 101 bridge from the cave. On some of my posts from last year I talk about these bridges. They are historical for their Art Deco design but also because the were built during a span of time that made them strategic as part of the Post WWI recovery in Oregon, the Roosevelt Military Highway (which became Hwy 101), and later the recovery act from the 1930’s depression. And now they are a known touristic attraction along Hwy 101 on the Oregon Coast. 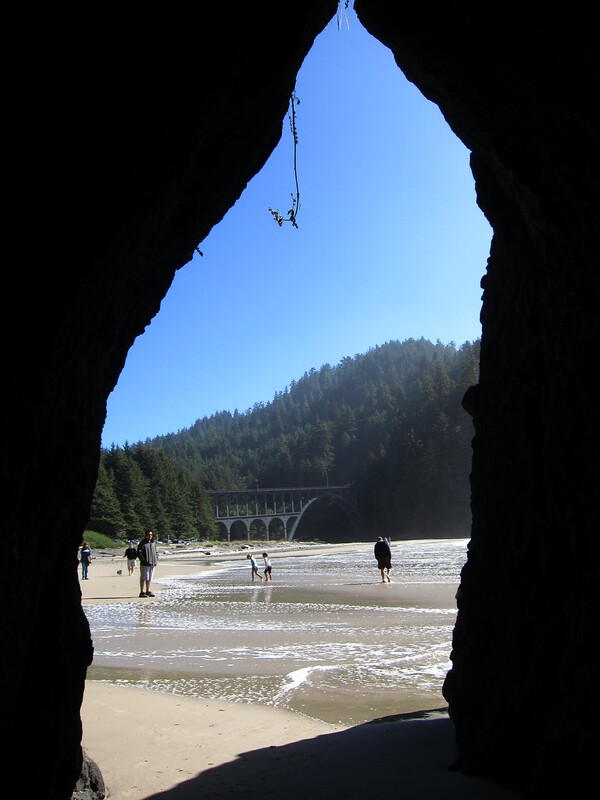 For more information on Oregon’s Highway 101 bridges, go here. The entrance to the cave. 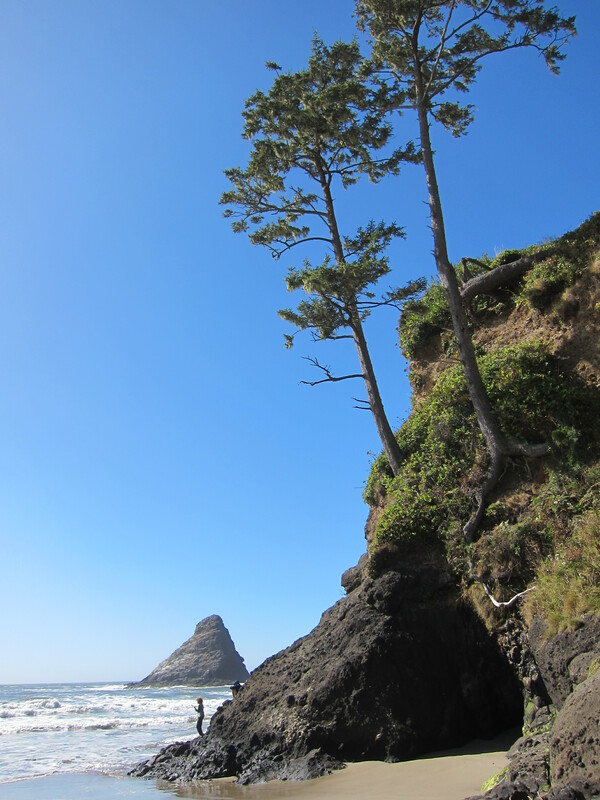 Check those trees, hanging strong on the side of the rock, surviving strong winds and storms. And that was it. We traveled back home via Hwy 36. I had a lot of fun riding the bike but always on the very safe side of things and being as smooth as possible. It was a bit windy on the last stretch home when already on the flat areas of the valley. Still the bike tracked fine just need some leaning adjustments into the side wind as needed. Overall, the Triumph did very well, the passenger seat could be better, though. I thought the problem would be the down slope, instead it probably is the shape and hardness. For people who plan on taking passengers on long trips I would recommend trying the gel seat option. Back Home. September 30th, 2012. 185 miles, 298 km, it was a great day overall, with very enjoyable company, a beautiful early fall day, a great motorcycle, and nice roads and riding. But wait, there is more! The icing on the cake is that in the evening I got to visit and have dinner with two motorcycle riders who I met here last year, who are from Switzerland and were riding through the area after a good tour to Colorado, Utah and California. It was just another perfect day. 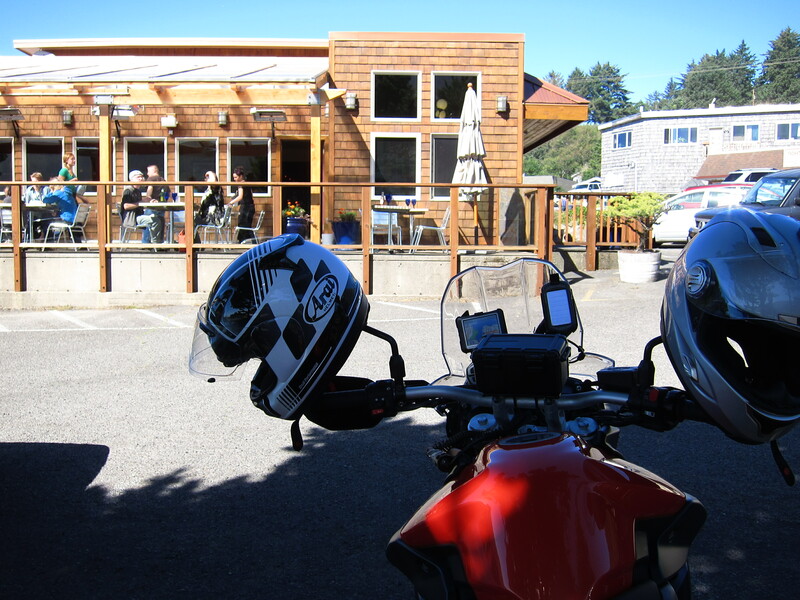 This entry was posted in Riding the Triumph and tagged 800XC, alsea falls, Triumph Tiger 800. Bookmark the permalink. You are braver than I am. I wouldn’t know how to ride 2-up. I’ve only done it once and it was in an emergency. I nearly dumped my bike when he climbed on too. It was okay once I got rolling, but I was always worried about stopping. 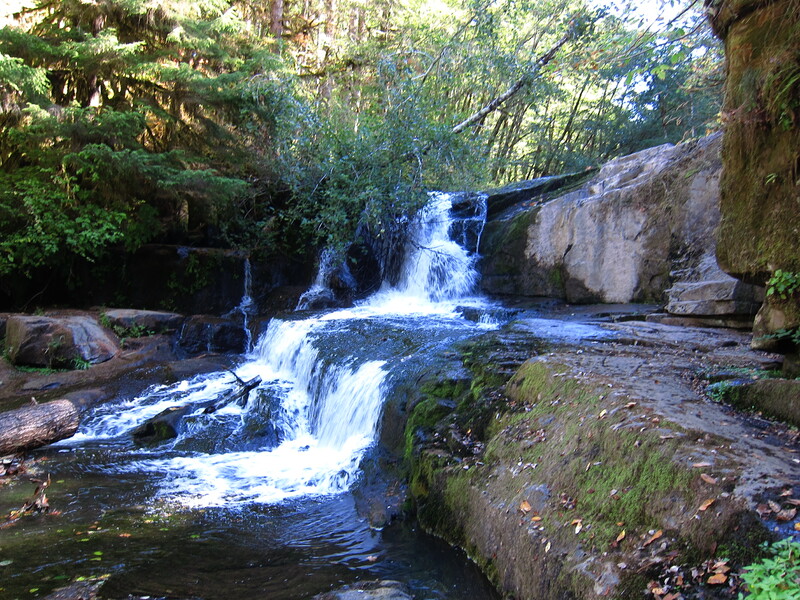 I keep missing Alsea Falls, as I go straight through at the stop sign. Next time I will take your advise and turn right and follow your directions. Balancing on that log looks hard to do, I’m not sure I could do that either, as I don’t play soccer. I saw a Ducati Streetfighter 848 but it wasn’t yellow. I immediately thought of you . 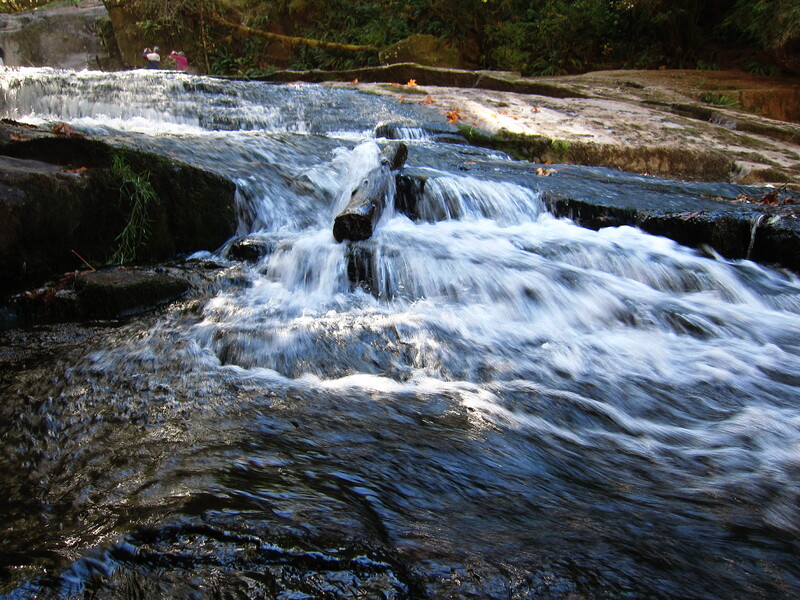 . .
Alsea falls is really easy to find, especially if you start from Alsea on 34. If that 848 wasn’t yellow than it was not quite the same. Yellow rules! Hope all is good with you and Yvonne.